At the end of his rope after chiropractic, physical therapy, massage and surgery, a Transportation Planning Consultant finds relief with Gokhale Method Foundations Course. Travis Dunn, PhD, remembers clearly the onset of his excruciating back pain. He was all of 24 years old. He survived his workday by taking walking breaks—some were part of his regular routine of walking to meetings or lunch. Others were add-ons to a fully loaded workday. All told, he’d spend an hour or so walking each day, just so he could sit and work. When the pain became unbearable, he would rearrange his desk and stand at his computer, which helped only slightly. Over the following two years Dunn tried therapeutic massage—“short-term relief measured in hours, not days.” Next came six months of physical therapy, which provided some help if he maintained a strict regimen. Dunn had cortisone injections twice, with no benefit. Dunn finally went to an orthopedic surgeon who, unlike the chiropractor, saw nothing of concern on the x-rays. “He looked at the same x-rays as my chiropractor and said, “You can’t see anything from these.” The orthopedist ordered an MRI, which showed a herniated L4-L5 disc. After exhausting what he thought were all of his alternatives, he had surgery in December 2006, an L4-L5 discectomy to remove the herniation. It relieved his occasional sciatic pain, but the low back pain continued. “I followed up with routine physical therapy for the next 6 months which helped me to manage the pain, but if I skipped even one day of stretches and exercises I was miserable,” he says. At this point Dunn estimates he was out of pocket about $7,000 and that his health insurance company had absorbed at least another $20,000. He also missed work for a month while recovering from the surgery. For the next several years he managed his pain with a strict regimen of stretching and exercise, but still struggled at work where he spent long hours sitting at a desk. The pain was constant, he remembers, with its severity tempered only modestly by stretching and back exercises. The ordeal was at least as taxing emotionally as it was physically and financially. “I was never clinically depressed, but over time it took a toll on me emotionally,” Dunn recalls. “I’m an engineer by training. I solve problems, and I couldn’t figure this one out. I was going to all the medical professionals you’re supposed to go to, and they couldn’t fix it." In April 2010, nearly five years after the pain began, he took the three-day intensive Gokhale Method Foundation course. “It was intuitive, in a way that was revealing, or eye opening,” he recalls. He had seen Gokhale Method creator Esther Gokhale’s book, and the class came naturally to him. “I remember sitting down for the opening session, and listening to her explanation of posture. It was very intuitive, and I felt very comfortable. I saw results almost immediately." Dunn shared an email he wrote to Gokhale six months after taking her course. "My low-back pain is, for the most part, a memory. I have applied your methods principally to my sitting, which was always the most uncomfortable position for me. The results are striking. Whereas in the past it was a struggle to get through a day (complete with standing / stretching / walking breaks every 10 minutes or so), I can now sit uninterrupted and pain free for long stretches." What does back pain cost? “As evidence of that, I have traveled from Boston in the past three months twice to Portugal (that's four flights of seven+ hours each), twice to Texas (four flights of three+ hours), and once to Mexico (two flights of four+ hours). Each time, I flew comfortably and pain free!" Dunn—now a 32-year-old transportation planning consultant—travels regularly overseas and has driven twice across the country—all pain free. And his advice to others in back pain? Hi, my name is Chris, I have just today (good friday) discovered , by way of thr net, about thr Gokhalemethod.After reading for an hour about this topic I have purchased the 8 step book and can't wait to get started.I have had a crook back for about 34 years (I am 54 now) so have been trying all sorts of techniques too relieve the pain.Chiro on and off for years , yoga till ithurts, swimming.I have a herniated l4 l5 disc.I started doing a exercise that I say on Dr Micolas website (same one I found about Gokhalemethod) god bless the Www.It was called Foundation Training,.I haave been doing some of the stretches shone on there and they have been great, the best my backhas been in years. I ran into my chiropractor 2 days ago in the organic shop up the road, and he wantad to know where I'd been lately, I told him I'd been to busy playing golf to come and see him.This Foundation method seems very similar to Gokhalemethod but a lot more!!!! Does anyone with a crook back , ever get better doing yoga ? I live in Tasmania and I am in the process of getting my final certification to teach the Gokhale Method Foundation Course here in Australia. I have only been back in AU for a few days. As part of the teaching process, I still have some case studies to do before I gain final certification. After that process is complete, I am looking to teach the Gokhale Foundation course here in Tasmania as well as on the mainland down the road. I would love to hear more about how you are doing now that you have discovered the "8 Steps to a Pain-Free Back Book." The stretch-sitting and stretch-lying should be particularly helpful for your situation of having a herniated L4-L5 Disc. Plus these postures are easy for you to incorporate into your everyday life to help you get immediate results These postures done correctly stretch the spine taking pressure off of the discs and preventing further damage. The benefits are reduced muscle pain and increased circulation around the spine which supports quicker healing and better nerve function. I would caution you to take things slowly and be gentle. Yoga would probably benefit you if you do not push the poses. That would only further harm what you are trying to heal. All the best to you in your journey to live a pain-free life. p.s. 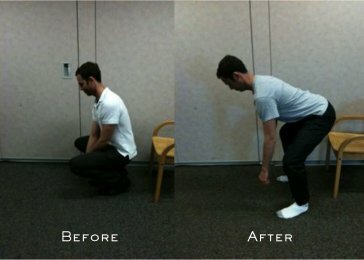 The before and after photographs of Travis were taken in a Gokhale Method Foundation Course.